HCR Racing is proud to announce the industry’s first long travel kit for the Polaris RZR XP 900 for only $4,999.00! No other kit will compare…period! It’s the first production UTV long travel kit to come with King 2.5 reservoir shocks, boxed arched radius rods for unequaled ground clearance, 17″+ travel, high clearance boxed front a-arms, 4″ longer wheelbase, and 70″ wide. Without a doubt, if you’re looking for the ultimate performance for your RZR XP, look no further. 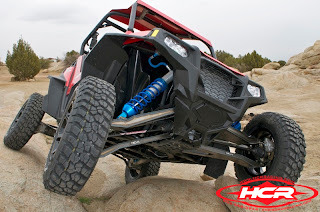 HCR Racing’s RZR XP 900 long travel kit will exceed all your expectations.